There is no shortage of options to choose from when it comes to selecting a ferry from Indonesia to Bali. There are 15 ferry companies with a combined offering of 26 Ferry Routes connecting Gili Air to Serangan, Gili Trawangan to Serangan, Padang Bai, Amed, Sanur & Benoa Harbour, Teluk Kode to Serangan & Padang Bai, Gili Air to Serangan, Padang Bai, Amed & Sanur, Gili Trawangan to Serangan, Padang Bai, Amed, Sanur & Benoa Harbour, Teluk Kode to Serangan & Padang Bai, Nusa Lembongan (Jungut Batu Beach) to Serangan & Sanur, Gili Trawangan to Serangan, Padang Bai, Amed, Sanur & Benoa Harbour, Gili Air to Serangan, Padang Bai, Amed & Sanur, Bangsal to Amed, Serangan, Padang Bai & Benoa Harbour & Gili Air to Serangan, Padang Bai, Amed & Sanur. The fastest route between Indonesia and Bali is Nusa Lembongan (Mushroom Beach) to Sanur with a crossing duration of around 30 minutes. With so many routes on offer we make it simple by comparing all similar routes in one search so you can quickly find what you are looking for. Indonesia is the world’s 4th most populous country situated in Southeast Asia, comprising over 17,000 islands stretched along the equator, of which only 8,000 are inhabited. 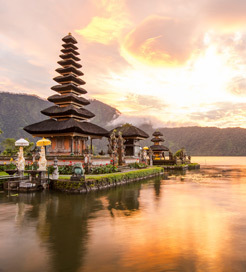 As you would expect from the largest archipelago on the planet, Indonesia has an incredibly diverse landscape and culture, with over 300 languages spoken, the world’s 2nd largest tropical forest, 130 active volcanoes and 1,000’s of spectacular temples spread across the islands. 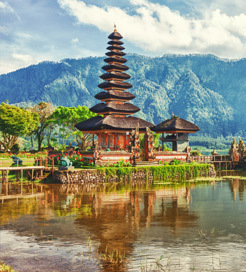 Most tourists flock to Bali, the hub for luxury resorts, stunning beaches and excellent surf breaks. The capital, Jakarta has great shopping spots and the largest mosque in Southeast Asia, whilst the Gili Islands offer a buzzing nightlife tailored for backpackers. Given the sheer quantity of islands in Indonesia, travelling by ferry is the best way to get around. It has an extensive ferry network offering domestic routes to and from some of the most popular destinations in the country, as well as international crossings to Singapore, which are all operated by a wide selection of ferry companies.